Editor: Palmer Cooper, Joy A. 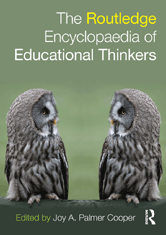 The Routledge Encyclopaedia of Educational Thinkers analyses the most important, influential, innovative and interesting thinkers on education of all time. Each of the chronologically arranged entries explores why a particular thinker is significant for those who study education and explores the social, historical and political contexts in which the thinker worked.